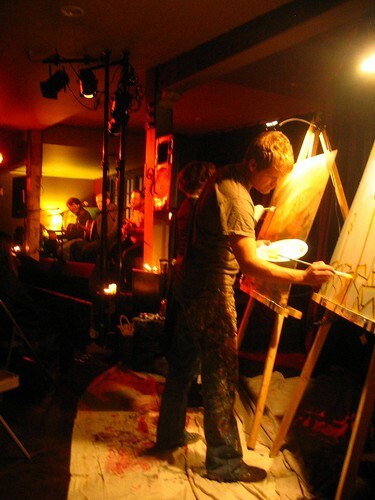 Fremont Abbey is hosting the 43rd incarnation of The Round tonight at 8 p.m. Their annual holiday party tonight will feature music, poetry and painting. Tonight’s show includes many alumni from 2008 like musicians Aaron Sprinkle of Fair, Josh Dawson of Slender Means, Gabe Archer of The Pale Pacific, as well as poets eLa, Rose McAleese, and Sara Brickman. Scott Erickson, Skye Graves and Brent Holland will be on hand to add a visual element to tonight’s festivities. Tickets cost $8-12 at the door, on a sliding scale, and doors open at 7:30, weather notwithstanding. It should be a fantastic way to start a chilly Seattle weekend at a cozy and intimate gathering of musicians and artists.